Turkey Says Autopsies Of Syrian Victims Show Evidence Of Sarin Exposure : The Two-Way Dozens of victims of Tuesday's attack were treated at a decontamination center across the border, and autopsies of the dead showed chemical weapons were used, the Turkish government says. Experts in Turkey did autopsies on Wednesday on Syrians killed Tuesday in Idlib. Turkish Justice Minister Bekir Bozdag said results show they were subjected to chemical weapons in the attack by Syrian government forces. Autopsies of victims of a deadly attack in Khan Shaykhun, Syria, show they were killed by chemical weapons, Turkey's Health Ministry says. The Turkish government says dozens of victims were treated across the border in Turkey, and several died. Their autopsies revealed evidence of exposure to sarin, the government said Thursday. Also on Thursday, U.S. Secretary of State Rex Tillerson said "it would seem" there is no role for Syrian President Bashar Assad to continue governing his country and that efforts are "underway" to build a coalition to remove him. He would not confirm whether the U.S. was considering military involvement, simply saying an attack using chemical weapons is "a serious matter. It requires a serious response." As NPR reported Wednesday, experts already suspected a powerful nerve agent like sarin was the toxic chemical used in the attack, based on the symptoms shown by victims. Sarin is a chemical weapon that is prohibited in war, under several international treaties. 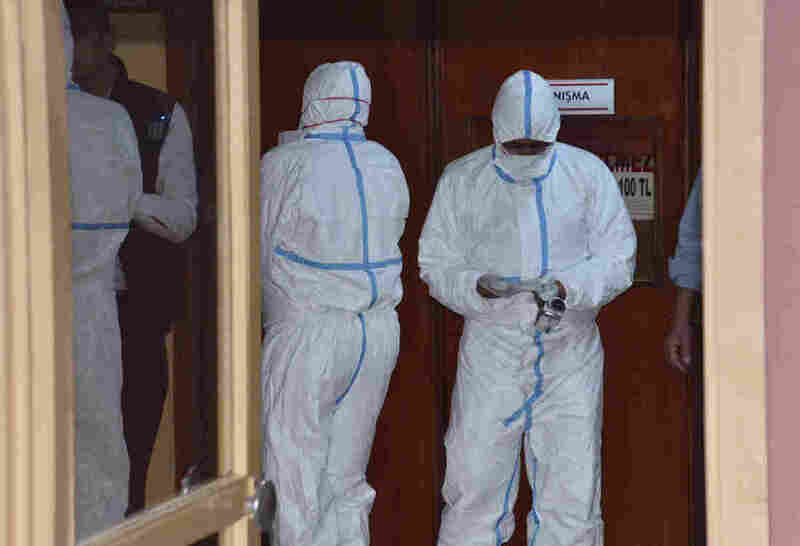 "[T]he Turkish government — a close ally of Syria's rebels — set up a decontamination center at a border crossing in Hatay province, where the victims were initially treated before being moved to hospitals. "The Turkish Health Ministry later issued a statement saying that 'according to the results of the first analysis, there were findings suggesting that the patients were exposed to chemical substance (sarin).' "
Victims were suffocating, convulsing and foaming at the mouth, aid agencies report. "Paramedics used fire hoses to wash the chemicals from the bodies of victims," the AP writes. "He says he saw entire families being pulled from their apartments, lifeless. The strikes came just at daybreak, he said, 'before the children would be leaving for school or the parents for work.' "
World leaders have denounced the Assad regime for the attack, which included a follow-up shelling targeting a hospital treating victims of the initial attack. Assad's forces have used chemical weapons before, including a sarin attack on a Damascus suburb in 2013 that left hundreds dead. But Assad and his Russian allies deny responsibility for the newest attack. They maintain that the Syrian government has destroyed all its chemical weapons, as it agreed to do after that 2013 strike. Instead, they claim the strike was a conventional weapons strike that accidentally hit an arsenal of chemical weapons belonging to the rebels. "Kaszeta says ... nerve agents are unstable and are typically stored as two separate chemicals. With sarin, for example, one of those precursor chemicals is highly flammable isopropyl alcohol.
" 'You drop a bomb on it, the whole thing is going up in a huge fireball,' he says. Even if the nerve agent was pre-mixed, a bomb strike would fail to disperse it in a way that could cause mass casualties. "Kaszeta says he thinks the most likely source of chemical was the Syrian regime. Sarin and other nerve agents are hard to make, and it's unlikely that rebel groups would have access to it. ... The Syrian regime is still believed to have experts who could make nerve agent from scratch." The U.N. Security Council has drafted a resolution to condemn the use of chemical weapons in Syria; the U.S. hopes for a vote before the end of the day Thursday. The Organization for the Prohibition of Chemical Weapons, an international watchdog group, has "initiated contact" with Syria in connection to the attack, and is actively investigating the situation. Meanwhile, observers are wondering what options the U.S. is considering in its response. Tillerson's comments on Thursday were vague, with references to Assad's "uncertain" future and the need for "an appropriate response" to the strike. President Trump also addressed the Syrian strike in conversations with reporters on Air Force One Thursday afternoon. Asked if Assad should step down, Trump said, "I think what happened in Syria is a disgrace to humanity, and he's there, and I guess he's running things, so I guess something should happen." Trump said the attack "shouldn't be allowed to happen," but he refused to comment on specific responses. "I don't want to say what I'm going to be doing," he said. "A Pentagon official tells NPR that the administration is looking at a variety of options, ranging from economic to diplomatic to military to respond to a chemical attack in Syria this week," NPR's Tom Bowman reports. "President Trump is slated to meet with his top national security officials Thursday at Mar-a-Lago."